Jesus Christ her little Child”. May we all be able to enjoy giving and receiving warmth and kindness throughout the Christmas period. Families’ Basic Needs Not Being Met is the key message of the 17th Vulnerability report released by NZCCSS. The September quarter looks at the increase over 4 years for rent and energy – the two items that low income families must pay before they buy food – and finds there has been an 11.9% increase in price. When this is seen against the additional 8.1% increase in benefits, the reality for low income families is that many basic necessities are simply being traded-off – nutritious food, visits to GPs, dentists, school trips, supplies and activities. This report is a timely reminded as we fast approach Christmas that without a significant increase to state benefits to support vulnerable families to live in dignity, a small but significant group of New Zealanders will continue to struggle to afford even basic necessities let alone a present under the tree for the kids. Read the full report and NZCCSS media release here. Is New Zealand A Great Place to Grow Old? Wellington City Council First to Pay Staff a Living wage. If you’re living in Wellington, and you are one of 450 staff earning below the living wage (18.40 an hour) this present is for you. The Council voted 9-5 in favour of phasing in a living wage for staff directly employed by the Council from January 1. Wellington City Council is also bringing parking wardens back in house - which will improve the service and lift their wages - another piece of good news for Christmas for a group of low paid workers. If you’re raising grandchildren there’s a fantastic present in the sack for you. From January 2013 carers will receive an establishment grant of $350 for costs related to settling a child into their new home, a School and Year Start-Up payment ranging from $400 to $550 to cover costs related to schooling and annual expenses, and there’s also a new “Extraordinary Care Fund” for financial assistance that recognises severe challenges faced by grandparents raising grandchildren with special need. As Diane Vivian, Grandparents Raising Grandchildren Trust, says “We are absolutely delighted with this announcement. We have worked long and hard to secure this much needed extra funding. It recognises the financial burden experienced by grandparents when the children first arrive and the additional burdens at the start of school years.”. This is a great present for a group of carers who have long been out of sight, out of mind, and out of pocket while supporting a particularly vulnerable group of children on what is often a meagre income. Will Mary and Joseph Find Improved Lodgings ? A Housing Warrant of Fitness is Being Tested by Councils. More seasonal good news comes with the next steps in developing a rental housing warrant of fitness being announced. The NZ Green Building Council & Otago University researchers are working with five councils around New Zealand to test a WOF tool.Wellington City Council and Dunedin City Councilare both part of the trial, as well as Tauranga Auckland and Christchurch. Nearly 5,000 new community housing units could result if the Government is willing to meet the call more investment by Government contained in an open letter from Community Housing Aotearoa. Social Housing changes are being pushed ahead at a frantic pace and with scant regard to good consultation practice. The Government is determined to stick to the timetable established to implement the social housing changes announced in the May Budget and in the process is lapsing into the bad habits of Government consultation by releasing a “consultation document” just prior to Christmas with submissions due 7th February. The consultation document on the regulatory reform affecting community housing providers who wish to receive Income Related Rent Subsidy (IRRS) has not yet been released but NZCCSS understands that it will be available on the MBIE website from 20 December 2013, so keep an eye on that website as well as the Social Housing Unit in the lead-up to Christmas. Social Housing Assessment is set to be transferred from HNZ to the Ministry of Social Development beginning from 14 April 2014. There is information on the MSD website explaining the changes including a social housing changes factsheet. HNZ will continue to be the landlord for HNZ tenants but from 14 April new applicants will be assessed by MSD. Further information will be sent to tenants and other stakeholders early in the New Year. NZCCSS is working with Community Housing Aotearoa to create a Tenancy/Client Matters working group to gather sector views to inform this transition process. HNZ Existing Tenants Will Face Further Uncertainty Over Christmas as HNZ has still not given any more information to them about how it will handle the extension of reviewable tenancies to all HNZ tenants. The Christmas newsletter from HNZ simply tells tenants that no final decisions have been made and more information will be available early in the New Year. Is the Rebuild Worsening Poverty in Christchurch? Christchurch Methodist Mission Chief Executive Mary Richardson said yes to this question at the annual Public Studies Association conference held at the University of Canterbury - “The rebuild seems squarely aimed at the hopes and aspiration of the well-off, but the latest census figures show half of Christchurch gets by on an income of $30,000 a year. So it’s certainly not a rich city“ And Mary sees this as the result of an ‘inadvertent self-reinforcing bias’ within Cera that has led to the recovery being led by a group of people all talking to other people just like themselves – educated, higher earners and young. In contrast Mary describes a forgotten Christchurch, the one that has always struggled with employment, parenting, and mental health issues but since the earthquake must now also cope with a housing situation, where rents are just too high, and families are now sharing houses, camping in garages and sleeping cars. Check out the full article on Stuff to gain a new insight into Who is Christchurch? Looking for the Perfect Christmas Gift for the Thinking Person? 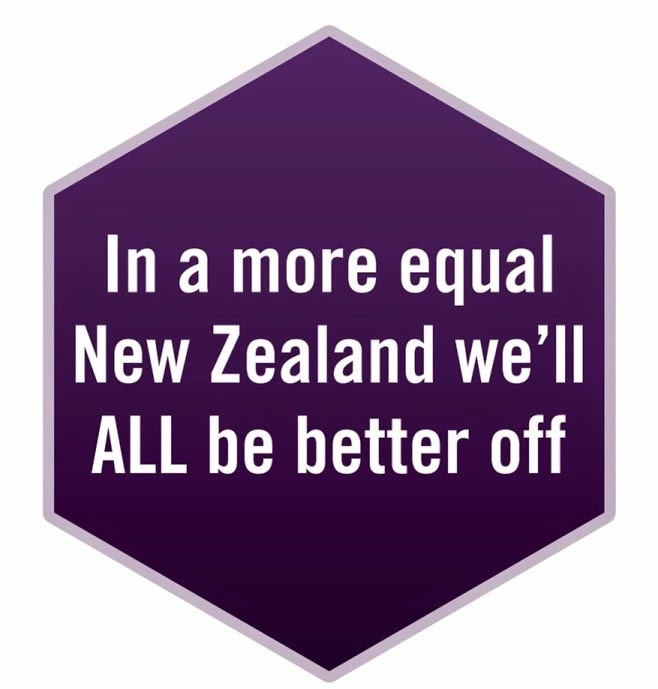 Then check out BWB Books website for “Inequality: A NZ Crisis”or one of the e-books in BWB texts “Inequality and the West” by Prof Robert Wade. Indeed, the whole BWB catalogue is a treasure trove of gift ideas. Or what about the “Christmas Appetiser’ CD that features 27 short programmes that include some notable New Zealanders like Judy Bailey, Petra Hust, Kerry Woodham and Pippa Wetzel sharing the true meaning of Christmas in a light hearted way. All thanks to the NZ Christian Broadcasting Association [phone 0508 FREE CD (0508 373 323). This symposium examines the power of collective and collaborative action for Hauora Māori. Using exemplars of effective Māori public health action, foundational philosophies and relationships are examined alongside innovations in Māori public health. This one day course will explore current issues in child and youth health promotion in New Zealand, and examine how a public health approach might improve child protection outcomes. To find out more check out this link. Monday 23 December 2013 – Monday 13 January 2013.